You will be given a reference e-book to read which has 578 pages And the test will be based on that e-book , you can take final test within 1 year of purchase. Objective C refers to a high-level, object-oriented and general purpose programming language which is capable of effectively adding Small-talk style messaging into the popular programming language called C. Objective C is also known as the major programming language which is primarily used by Apple for some of its operating systems including iOS and OS X. This programming language was originally developed during the early years of the 80s. It should be noted that the most generic programs run by Objective C that do not utilize Cocoa Touch or Cocoa libraries can be easily compiled in systems that are now supported by Clang and GCC. It is also important for you to note that the model used in Objective C programming language is mainly based on passing messages into object instances. It also requires you to separately declare code blocks when implementing a class and an interface. Conventionally, those who use Objective C require developers to put interface within a header file. Developers are also required to implement codes within a file. Objective C can also be defined as a simple yet effective computer language which is primarily designed to allow more sophisticated object oriented programming. It comes with powerful extensions that work in improving its programming capabilities. It should also be noted that since Objective C runs in an object-oriented environment, it comes with a few essential parts like the object library, object oriented programming language, runtime environment and development tools suite. 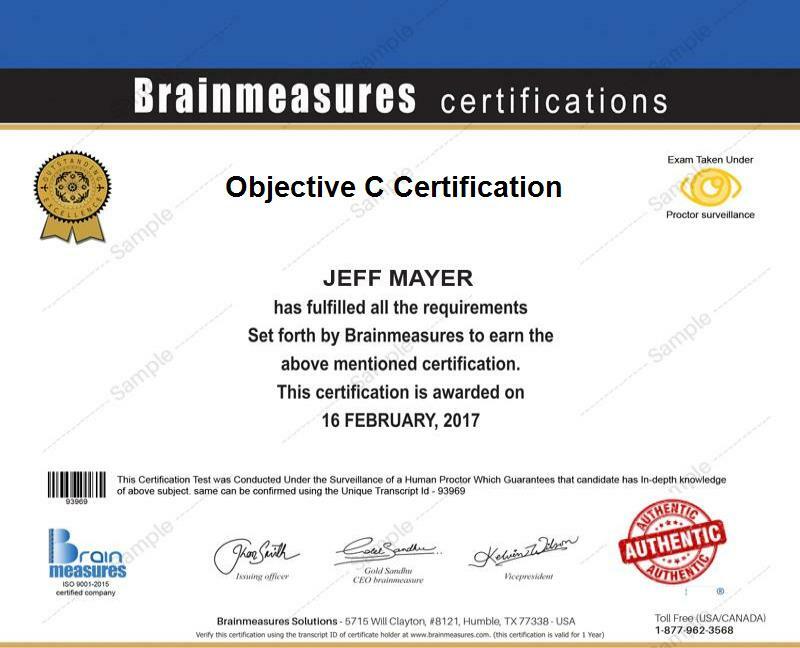 If you want to obtain a more comprehensive and complete understanding about Objective C, then be aware that Brainmeasures, a highly reputable and recognizable online certification company, is now offering an Objective C certification program which can work suitably for everyone. The Objective C course which you can now access at Brainmeasures is your ticket towards gaining a more complete understanding about the programming language so taking part in the program is the best thing that you can do. By deciding to enroll in this online certification course, you will get the chance to undergo an Objective C training which works in increasing your knowledge about all the vital aspects of this programming language, its history and scope, its major functions and objectives, its major components and elements and the most effective techniques that you can use to effectively perform your programming functions through it. Once you receive your Objective C certificate, you will no longer have a hard time showing to the industry that you are skillful and knowledgeable enough when it comes to using the Objective C programming language. How to effectively compile and run programs through the Objective C programming language? How to effectively access data encapsulation and instance variables? How to effectively formulate the best programming decisions with the help of Objective C? The Objective C certification program which is now available at Brainmeasures is also beneficial to a wide range of individuals and professionals especially those who form part of the IT and programming industry. This certification course aims to target numerous professionals including programmers, web and application developers, system administrators and any other individuals and professionals who require a great level of understanding about Objective C and who are greatly interested about writing applications and programs with the help of Objective C.
Being an Objective C certification holder is also very rewarding considering its ability to help you boost your financial stability. As an Objective C certification holder, you can increase the level of your salary by working as an Objective C developer because it allows you to earn around $76,000 to $117,000 annually. Your certification is also useful in your attempt to work as an Objective C consultant because this profession allows you to enjoy as much as $137,000 every year.